purpose: to control beach erosion. It began 10/4/12 and was completed 12/7/12, working 24 hours a ­day. During that time, 450,000 cubic yards of sand were delivered at a cost of $28,000,000. 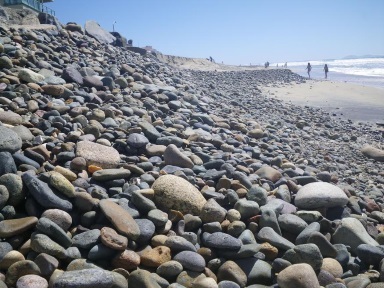 The sand was mined a mile off the coast of Mission Beach, and brought by ship to Imperial Beach. There it was pumped ashore from the ship's hold along with water through a large steel pipe, and deposited on the beach. Starting at Cortez Avenue, the pipe was gradually moved northward, and multiple bulldozers were used to distribute the material. The beach was widened by an average of 200 yards, the process ending at Elder Avenue. break. 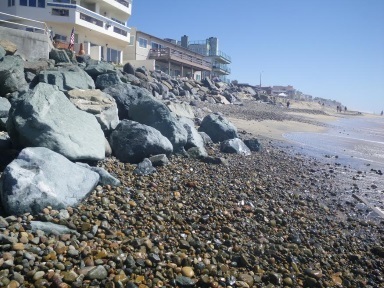 Plus, the bulk of sand sloped several feet lower near beach properties than near the shore. At times, after breaching the berm during high tides, ocean water pooled in this low area, creating a temporary lagoon, and causing property damage along the south end of Seacoast Drive. again. But nature has shown that it can't be changed successfully, at least not for long.